Hazelnut is a fruit of the hazel tree, which can reach up to 8 meters. It has oval leaves and the fruits grow in clusters, there are a few nuts in a cluster. Hazelnut is one of the fruits that are practically protectors of the Christmas tables along with the walnut. They add irresistible and rich flavor to the baked desserts combined with chocolate. Hazelnuts contain vitamins, minerals, protein, fiber and healthy fats. Hazelnuts provide many health benefits and they deserve to be included in your daily diet. For a start we will briefly examine the nutritional profile of this fruit.100 grams of hazelnuts have 628 kcal energy value, 61% fat, 17% carbohydrates and 15% protein. From minerals contains: calcium (114), magnesium (163 mg), phosphorus (290 mg), iron (4.7 mg), zinc (2.5 mg), copper (1.8 mg), manganese (6 mg) and selenium (2.4 µg). From vitamins contains: vitamin C (6.3 mg), thiamine (0.6 mg), riboflavin (0.1 mg), niacin (1.8 mg), pantothenic acid (1 mg), vitamin B6 (0.5 mg), betaine (0.4 mg), vitamin E (15 mg), folic acid (68 µg) and vitamin K (14 mg). Regarding to the usefulness, of hazelnuts on the human health, certainly you can imagine that it is overwhelming. As we stated above hazelnut is rich with many vitamins and minerals that are needed for the human body. Scientists say that 30-60 grams of hazelnuts is the optimal dose needed to be entered daily, in order to maximally exploit the medicinal properties of the hazelnuts. Hazelnut has a proven effect on slowing the aging and reducing the risk of many malignant diseases. Regular consumption of hazelnuts helps to reduce the cholesterol levels and the triglycerides in the blood, regulates the blood pressure, heart rate and decreases the risk of heart attack and stroke. 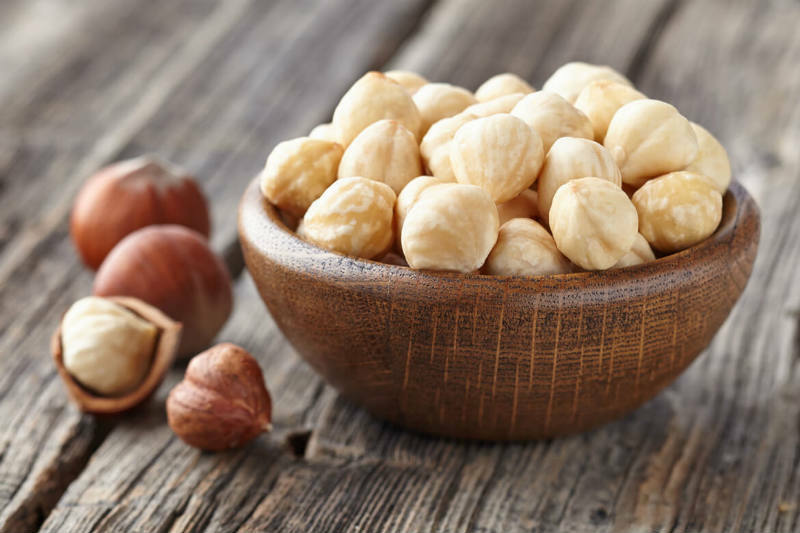 Scientists say that the amino acids found in hazelnuts have great anti-inflammatory action, and a powerful inhibitory mechanism against the growth of malignant cells. Scientists also add that hazelnuts protect especially against breast and prostate cancer. Hazelnuts reduce the risk of diabetes and are suitable for consumption among diabetics. Phytochemicals for the body. Hazelnuts contain phytochemicals, including proanthocyanidin, quercetin and kaempferol. These proanthocyanidins belong to a group called flavonoids. Flavonoids are supporting the brain health, improving blood circulation and can reduce the symptoms associated with allergies. Eating a few hazelnuts for snacks provides your body with all these healthy benefits. Healthy fats. Hazelnuts contain healthy fats that can protect the health of the heart. Concretely, they are rich with healthy polyunsaturated and monounsaturated fats, and contain very few unhealthy unsaturated fats. Hazelnuts are a good source of oleic acid. Oleic acid lowers the bad LDL cholesterol, and raises the levels of the good HDL cholesterol in the body. It is interesting that flour and oil can also be prepared from hazelnuts, which are extremely healthy for consumption. But hazelnut oil, except for consumption, can be used for massage for both the adult and children, because it has great beneficial effect on the entire organism.